Definition: The Marketing Environment includes the Internal factors (employees, customers, shareholders, retailers & distributors, etc.) and the External factors( political, legal, social, technological, economic) that surround the business and influence its marketing operations. Some of these factors are controllable while some are uncontrollable and require business operations to change accordingly. Firms must be well aware of its marketing environment in which it is operating to overcome the negative impact the environment factors are imposing on firm’s marketing activities. 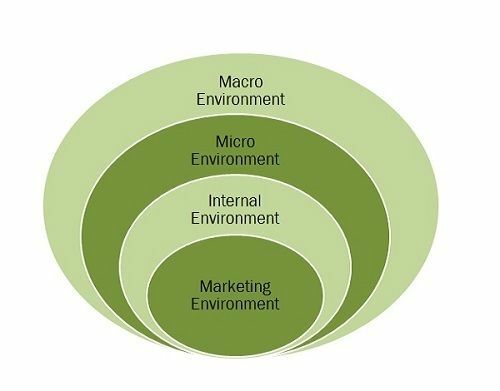 Internal Environment – The Internal Marketing Environment includes all the factors that are within the organization and affects the overall business operations. These factors include labor, inventory, company policy, logistics, budget, capital assets, etc. which are a part of the organization and affects the marketing decision and its relationship with the customers. These factors can be controlled by the firm. Microenvironment- The Micro Marketing Environment includes all those factors that are closely associated with the operations of the business and influences its functioning. 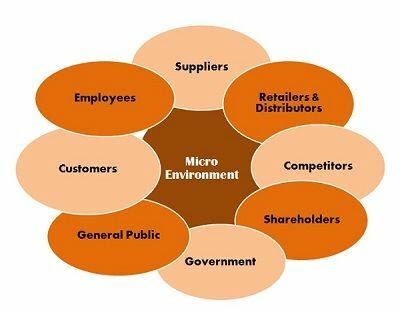 The microenvironment factors include customers, employees, suppliers, retailers & distributors, shareholders, Competitors, Government and General Public. These factors are controllable to some extent. Customers– Every business revolves around fulfilling the customer’s needs and wants. Thus, each marketing strategy is customer oriented that focuses on understanding the need of the customers and offering the best product that fulfills their needs. Employees– Employees are the main component of a business who contributes significantly to its success. The quality of employees depends on the training and motivation sessions given to them. Thus, Training & Development is crucial to impart marketing skills in an individual. Suppliers– Suppliers are the persons from whom the material is purchased to make a finished good and hence are very important for the organization. It is crucial to identify the suppliers existing in the market and choose the best that fulfills the firm’s requirement. Retailers & Distributors– The channel partners play an imperative role in determining the success of marketing operations. Being in direct touch with customers they can give suggestions about customer’s desires regarding a product and its services. Competitors– Keeping a close watch on competitors enables a company to design its marketing strategy according to the trend prevailing in the market. Shareholders– Shareholders are the owners of the company, and every firm has an objective of maximizing its shareholder’s wealth. Thus, marketing activities should be undertaken keeping in mind the returns to shareholders. Government– The Government departments make several policies viz. Pricing policy, credit policy, education policy, housing policy, etc. that do have an influence on the marketing strategies. A company has to keep track on these policies and make the marketing programs accordingly. General public– The business has some social responsibility towards the society in which it is operating. Thus, all the marketing activities should be designed that result in increased welfare of the society as a whole.3. 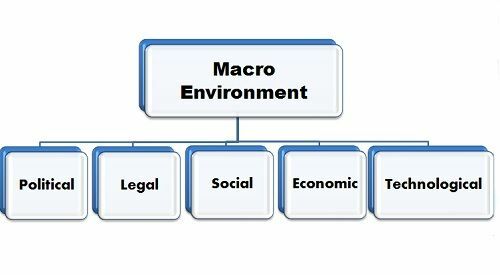 Macro Environment-The Macro Marketing Environment includes all those factors that exist outside the organization and can not be controlled. These factors majorly include Social, Economic, Technological Forces, Political and Legal Influences. These are also called as PESTLE framework. Political & Legal Factors– With the change in political parties, several changes are seen in the market in terms of trade, taxes, and duties, codes and practices, market regulations, etc. So the firm has to comply with all these changes and the violation of which could penalize its business operations. Economic Factors– Every business operates in the economy and is affected by the different phases it is undergoing. In the case of recession, the marketing practices should be different as what are followed during the inflation period. Social Factors– since business operates in a society and has some responsibility towards it must follow the marketing practices that do not harm the sentiments of people. Also, the companies are required to invest in the welfare of general people by constructing public conveniences, parks, sponsoring education, etc. Technological Factors– As technology is advancing day by day, the firms have to keep themselves updated so that customers needs can be met with more precision. Therefore, marketing environment plays a crucial role in the operations of a business and must be reviewed on a regular basis to avoid any difficulty. thanks for the great lesson about marketing environment. I would like to use this article for my master degree. Do you have information about the author or year when this was written? My God!! This was so helpful. Thank you very much. Great Post. Thanks for sharing useful information with us.